Hill profile: Hilly, this is not a tour for sissies! We expect that you will be able to ride a 50 mile ride that has 5000 feet of climb. We expect you to ride in all weather. Southern Spain. 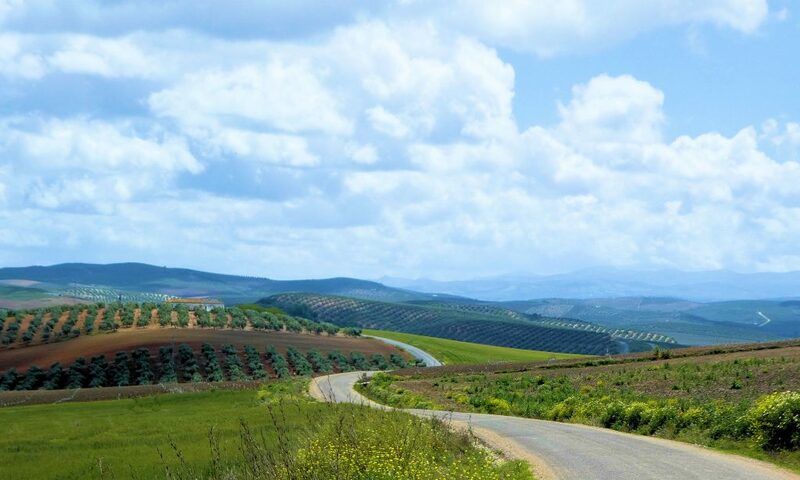 This beautiful region of Spain includes lush countryside as well as landscapes that will remind you of Arizona. There are hills, rivers and exquisite architecture reminiscent of the Arabian Nights. 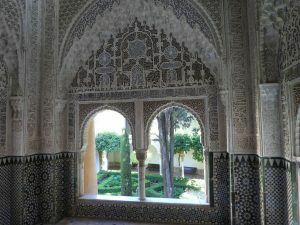 Visit the cities of Seville, Cordoba and Granada, as well as smaller towns of Ronda, Carmona and Zuheros. 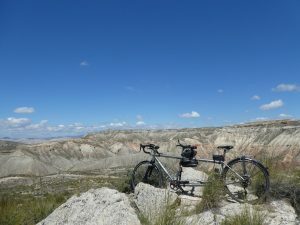 Adventures in Tandem will again partner with Naturbike to offer this eleven night tour beginning in Seville and ending in Granada, with optional transport to the airports in Malaga or Seville. This adventure runs from May 2 to 13, 2020. Riding will be in the 30 to 70 mile a day range. This tour is suitable to people who embrace hills! Saturday We begin the tour in Seville, the capital of the Andalusia region of Spain. You will have the opportunity to come early and spend a few extra days before the tour starts in Seville. You won’t want to miss seeing the royal palace, Alcázar of Seville, with it’s Moorish architecture, the huge Cathedral of Seville and Giralda Tower. 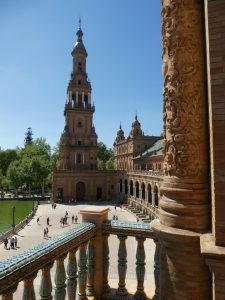 You can also take in a Flamenco show and walk through the winding small streets in the old city or tour the Plaza de España. Seville has a lot of bike lanes. We will offer a 14 mile loop around the city. We will enjoy a dinner together in Seville. Day 3 Monday We leave Ronda and cycle to the small town of Carmona. 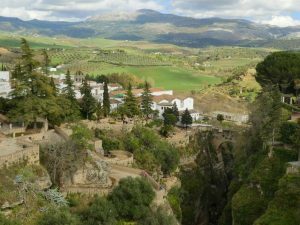 Along the way we will see Setenil de las Bodegas (houses built into rocks) and pass through the lovely white village of Olvera. Look up and you will see the 13th century Arab Fortress looming above. Ride through the gates surrounding the city of Carmona and explore its medieval streets. We will enjoy a group dinner. Ride choices are 52 or 74 miles, hilly but with more down than up! 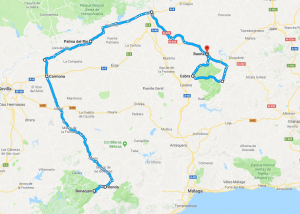 On Day 4, you will have the choice of riding 27, 55 or 76 miles along back roads into the city of Córdoba where we will be spending two nights. 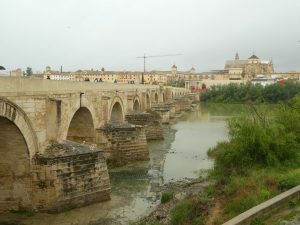 Córdoba was a beacon of religious tolerance, art, philosophy and science in the 10th century when the rest of Europe was in the midst of the Dark Ages. Our hotel is in the historic Jewish Quarter of the city, very close to many places of interest. We particularly enjoyed touring the Museum of Al-Andalus Life and Calahorra Tower. Dinner will be on your own in the many restaurants near our hotel. 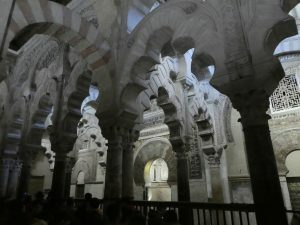 We will meet a guide at 9am to take a two to three hour walking tour of the old city and the Mezquita Cathedral. This mosque turned cathedral is amazing in its Moorish architecture and grandeur. You will be on your own for the afternoon to see the sights. We will also offer a loop ride for those who cannot do a day off the bike. Dinner is on your own as there are plenty of restaurants, or if you like to go to bed earlier, you can grab a bite at one of the many tapas bars in the area. Day 6 Thursday We leave Cordoba on Day 6 riding across the Roman Bridge and then to the town of Zuheros. The riding today is on quiet roads through farms and olive groves. The 47 mile route is hilly, with more up than down. Take your time on the hills and soak in the incredible views. 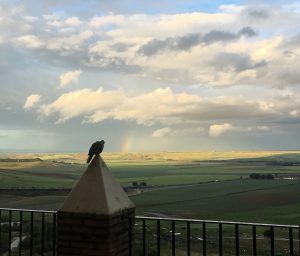 Once in Zuheros, we will enjoy two days at a small, country hotel that borders on a National Park and the Via Verde bike path. We will enjoy a group dinner. You can tour the Arab Fortress which dates back to the 9th century. On our layover day, you can do a loop ride in the area, stroll through the quaint town, visit the Castillo de Zuheros (which is in impressive ruins) and see the Cueva de los Murciélagos (underground caves). We offer a choice of rides, but our favorite is a 17 mile loop that takes you to the white hill towns of Luque and Zuheros and the caves. Part of the ride is along the Via Verde bike path. We will enjoy a group dinner. This region of Spain is called the Badlands. Many a spaghetti Western has been filmed here. On Day 8 we leave Zuheros and we, along with our bikes, will be transported about two hours to the Benalúa area. We will ride a choice of 25 or 44 mile rides in a completely different, now desertlike landscape. We will enjoy lunch at Rosalia’s Restaurant in Gorafe. You will have the opportunity to explore some of the hundreds of dolmen’s in the area and also an interpretive museum of the area. (A dolmen is a single chamber megalithic tomb built in the Bronze age about 5000 years ago.) We will check into our hotel – a very unique place where the rooms are all built into the clay hills. We will enjoy a group dinner at the hotel. We will enjoy a layover day in Benalúa. You will have the option to do a 41 mile loop ride to the preserved La Calahorra Castle from 1509, the Guadix cave homes and the Baroque style Guadix cathedral. We will also offer a hike through the badlands that you can take directly from the hotel. Dinner will be at the hotel. 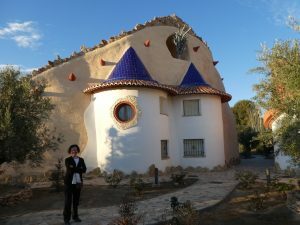 Day 10 Monday We leave the cave hotel and cycle into the foothills of the Sierra Nevada, following the old Moorish trading road from Guadix to Granada. The ride is along quiet roads with incredible views. You will see the snowy Sierra Nevada mountains in the distance. 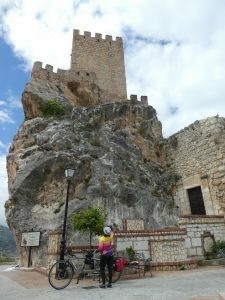 After a long climb, you will enjoy a ten mile downhill and then a ride into Granada. Our hotel is walking distance to the major city attractions, but enough on the edge of town so that you won’t have to ride long on busy streets. We will be spending two nights in Granada. You will be on your own for dinner at the many nearby eateries. Day 11 Tuesday We spend our last day exploring the city of Granada on foot. We will meet our guide to visit Alhambra. According to Lonely Planet, “Alhambra is Granada’s – and Europe’s – love letter to Moorish culture.” Alhambra is a fortress and palace with parts built in the 13th century. You could easily spend the day here, or you could also explore the city. You will also be reunited with your bike cases here and be able to disassemble your bike in the underground garage. We end the tour with a final group dinner in Granada. Day 12 Wednesday Our tour ends after breakfast. However, we will offer transport to the airport in either Malaga or Seville. Click here if you would like to see more pictures from our April 2019 scouting trip. As with most of our tours, we limit the size of the tour to a maximum of ten couples. So our tours fill up fast. We expect to begin accepting registrations for this tour in May 2019. Please sign up for our pre-notice if you are interested in the opportunity to sign up for this tour before we announce it to our full mailing list. Daily mileage can be seen in the chart below. The rides in italics are optional riding. The days with shorter ride options are transfers to remote start points. As you can see from the ascent and decent numbers below, there are lots of hills in Andalucia. 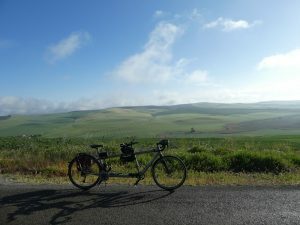 This cycle tour is for intermediate level cyclists. You should be able to ride 50 miles with 5000 feet of climb, although you have all day to do this.